Children are fickle little so and sos. Every parent knows the story. Child is going on playdate. Playdate includes a meal. When you pick your child up the host carer reports what they ate. 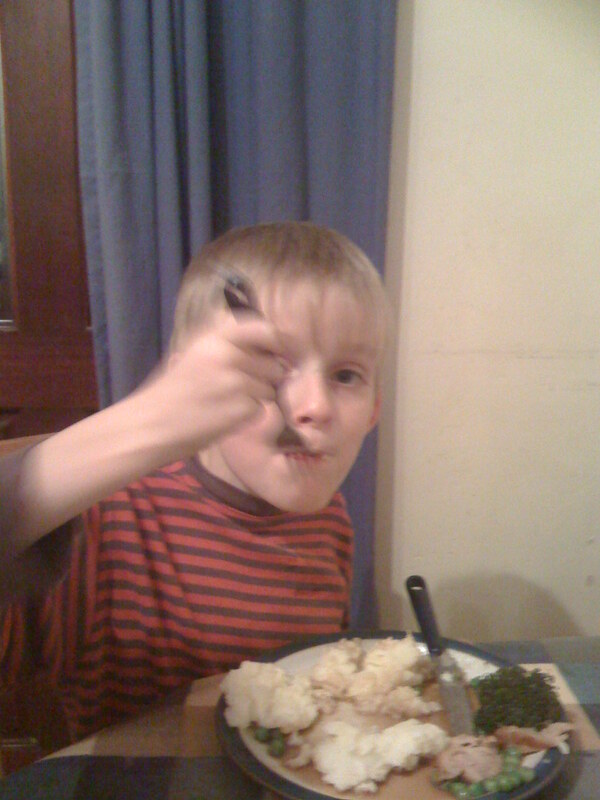 You discover Child either has eaten stuff you know they wouldn't touch with a bargepole at home or has refused to eat stuff you had assured the host that they love. DS2 ( yes, him again) had a close friend who he visited pretty much weekly when he was primary school age. It was only years later talking to his friend's mum that I found he had regularly eaten all sorts of stews and casseroles he wouldn't even contemplate at home. And my two eldest had a regular arrangement with two friends so that every Monday they went straight from school for tea. Their friends Granny was in charge and every week, for ease, she cooked the same meal. Sausage and mash. Every week she told me how much they seemed to enjoy it. I couldn't get them to eat it at home - I even bought the same brand of sausages. But they would only eat it at Will and Thomas' house. In turn I had a child round to play with my eldest. His mum assured me that spag bol was his absolute favourite. She even listed the ingredients she put in it so I did my best to replicate it. Would he eat it? Of course not! I resorted to feeding him chocolate spread sandwiches and hoped his mother wouldn't judge me. It's half term at the moment and I have been trying to find activities to entertain an age range of 4-13 on a budget. the older teens can fend for themselves pretty much-DS2 is happy to sleep most of the day and DS1 is in Portsmouth with his GF so probably best NOT to ask what he's found to do to entertain himself! I came up with the idea of pizza making. Cookery, creativity and lunch prepared by other hands to boot! A relaxed friend who also liked the idea for her four children volunteered her home ( yay, no mess in my kitchen!) and even provided a Granny to supervise the cooking. Granny, it transpires, is a pizza demon. She made dough by hand with 9 overexcited children. taught them good kneading techniques and provided an array of toppings including two types of sundried tomatoes, pesto, ham, two types of pepperoni, sweetcorn, peppers, rocket and two types of cheese for them to assemble their personal pizzas. I was sceptical when mine started adding pepperoni, sweetcorn and mozzarella to their pizzas. My children generally insist on margarita pizza and only certain brands. But something about the process of making their own food inspired them and of course they were more than happy to eat the results, "exotic' toppings and all. who also made their own lunch. But I don't know if the rule of "tea at someone elses house tastes better" applied today. If I had done this at my house would they have eaten it?' My friends 4 children obviously were at their own house but they are fairly adventurous eaters anyway and list things like olives and salad among their favourite foods. Whatever, it was a great day to spend a day, and I can tick the box for "engage in wholesome family activity" which earns me Fit Mother points which, I feel, entitles me to let them an hour or two of rubbish TV in the morning while I enjoy a sneaky half-term lie-in! Many thanks to Claire for letting us cover her kitchen in flour and of course to 'Granny' who patiently occupied all 9 children for hours without once shrieking or shouting! so impressed .... funny read, great idea, ... what a good friend, and WOW what a Granny, top lady ! Don't know what the 'select profile' means, so I'll just click anonymus, actually I'm Jo's Mum ! Thankyou Christine- I think if you actually subscribe it gives you the option to comment as yourself and via email or facebook etc. But glad you enjoyed the blog post-we had a great day!